In the last 48 hours I’ve had personal conversations with leaders from Latvia, Ukraine, Slovenia, Brazil, Bolivia, Canada, Germany, Serbia, Montenegro, South Africa, Namibia, Malaysia, Switzerland, India and the USA. That leaves only 175 countries to go before departing Sunday night J. Among many other things, everyone with whom I talk shares a common commitment to 1) the authority of Scripture, 2) the uniqueness of Christ, 3) the lostness of man, and 4) our inescapable responsibility to share the Good News with every soul on this planet – as soon as possible. This evening we honored the legacy of Billy Graham, the Father of the Lausanne Movement. It was his vision that rallied 2300 evangelical leaders from 150 countries in 1974 under the banner, “Let the Earth Hear His Voice.” As Graham declared in his opening address, “We here tonight stand firmly in the evangelical tradition of biblical faith”. Consistent with this claim he called upon the Congress to “reemphasize those biblical concepts which are essential to salvation;” namely, 1) the authority of Scripture, 2) the ‘lostness’ of man apart from Jesus Christ, 3) that salvation is in Jesus Christ alone, 4) that our witness must be by both word and deed, and 5) the necessity of evangelism for the salvation of souls. Looking back over the thirty-six years that have passed since that historic meeting, we can identify at least three lasting legacies. First, the Lausanne Covenant emerged as the standard to define the doctrinal and practical priorities of the evangelical movement. Second, the mission world reprioritized itself around the command to reach all people groups, as opposed to mere countries. Missiologist Ralph Winter later observed that his speech on ethne before the Lausanne Congress was the most important twenty minutes of his career. Finally, since Lausanne I, evangelicals have made significant strides in learning to work together in pursuit of the Great Commission. Sadly, for the most part the Grace Brethren Fellowship sat on the sidelines as the Lausanne Movement gained momentum. Having researched this period in our archives and by interviews, I see that our primary concern was fear of doctrinal compromise. People usually come to Christ to meet a need, and stay with Christ when they realize he is truth. We must use our greatest cognitive energies to get across the truth of who Jesus is. And speaking of persecution, the evening session was dedicated to prayer for the persecuted church. That includes the 200 delegates from China, who, at great personal expense raised all of the funds needs to participate in Lausanne III, only to be prohibited from participation at the last minute. May God comfort them once again. The most moving moment of the evening was the testimony of a young North Korean woman whose father was martyred for his faith. She has dedicated her life to returning to her homeland to fight for the spiritual and physical liberty of her people. 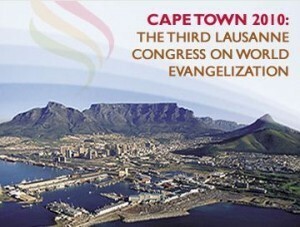 Dave Guiles, executive director of Grace Brethren International Missions, reports from the Third Lausanne Congress on World Evangelism. Today we were invited to look deeply into the brokenness of our world – the lonely child, the abandoned wife, the unemployed father, the elderly sick and dying; to explore the impact of wars, injustice and inequity. Arising from our group study of Ephesians 2, our theme was reconciliation: man to God and man with man. “There is more slavery today than in the time of Wilberforce.” According to U.N. estimates, there are 27 million slaves worldwide. Add to this number the 250 million Dalits of India, 250,000 of which are serving as temple prostitutes. “The ‘untouchables’ of India constitute civilization’s longest lasting slave system.” Their cry? “Bring to us the alternative society of the church of Jesus Christ.” – Joseph D’Souza. “When Jewish and Palestinian believers look at one another and say, ‘I love you,’ the world will know the true power of the Good News of Jesus Christ” – the perspective of a Messianic Jew and a Palestinian Christian. During the Rwandan Genocide, one million Tutsis perished in a 100 day massacre. Until that moment, Rwanda was considered the most Christianized country on planet earth. What went wrong (from an African perspective)? 4. An unhealthy relationship between church and state. A perspective on the crisis in the Balkans from a Serbian believer (at my discussion table) who is currently serving in Montenegro, “I have found no organization that can bring us together to laugh and share joy outside of Jesus Christ” – (making reference to the failed attempts by the European Union, the U.N. and U.S. to promote peace in his region). During the evening, our focus was on the Middle East. An Iranian leader shared that during Lausanne I (1974), they could only account for 500 believers in all of Iran. Since then, there have been more conversions that in the previous 1300 years. In his words, “Iran is the most open country in the world.” Of course, persecution is intense and repression is brutal. Throughout the Middle East, the overall percentage of Christians is shrinking, due to immigration (spurred on by fear of persecution) and the high birth rate of Muslim families. The mood today was much less ‘festive,’ as we considered the brokenness of a world dominated by sin and its effects. In the midst of universal pain, what is the role of the church? To what extent are evangelicals guilty of placing so much emphasis on the life to come that we can turn a blind eye to the here and now? I remember raising that type of question in a seminary class, and receiving a very simple answer. “Jesus,” I was told, “said ‘the poor you will always have with you.’” End of discussion. While true missionaries have always been committed to a Gospel in word and deed, I think we owe a debt to the emerging generation of young people who are challenging our often dualist approach to ministry. God created us as whole persons, and the true gospel impacts us holistically. Yes, like many I am concerned that the pendulum not swing to the other extreme. Yes, the emerging generation is making us uncomfortable with what at times appears to be an overemphasis on meeting physical needs. Like young people have always done, they are challenging many of our traditional categories and methods of doing ministry. But they are also the most globally connected and sensitive generation in history. They have grown up conscious of the reality that their world is broken. My prayer is that together we will find a God-honoring balance of ministry for the whole person in the real world in which God placed us. A global movement of reproducing churches (World Mission Churches) faithful to the Brethren heritage who are aware of the significance of the times and thrust into the mainstream of the movement of the Spirit of God in the fulfillment of their mission. Finally, during his fifteen year tenure as Executive Director, Julien actively pursued ministry partnerships with like-minded evangelicals and evangelical mission agencies. GBIM and the FGBC owe a great debt to this visionary leader, who weathered storms of criticism from some quarters and succeeded in bringing our movement into closer alignment with the global evangelical community. Dave what a wonderful and encouraging report from Capetown. Thank you for your insights and for honoring Tom so appropriately. My history with the FGBC and continued affiliation is precious to me yet I wonder if as a whole we (FGBC) have lost "the wonder of the gospel." The breathtaking beauty of Christ sovereignly building His church is all around us in this world and it seems to me that much of the church in America and the west is ignorant of it and/or somehow bored by the reality of it. When the current expansion of the church in Africa, Asia and Latin America is presented our eyes seem to glaze as if we are high on hashish. I pray that we will soon be delivered from whatever we are drunk upon or addicted to and "the "wonder of the gospel" and a love for Christ and His church expanding around the corner and around the world will once again be the solitary passion that beats within our chest. Our only hope of course is found in the gospel. Let us preach the gospel to ourselves. "Dear Lord deliver us from that which dulls our senses to the world you died to redeem. Forgive us for the arrogance that demands that all our brothers and sisters around the world have all things parsed correctly as we have them parsed. May our first love for You be rekindled like that of a recently engaged young woman who cannot keep from showing off her engagement ring and speaking of her fiance'. We foolishly proclaim You live in us and yet our callousness towards people in general and to the world You so love betrays that claim. Jesus You died for our arrogance, our lack of love for You, our idols and our selfishness Thank You for the 100% complete forgiveness found in You through Your death upon the cross. We recognize there is more mercy in You than there is sin in us. We thank you that Your love and Your passion dwells in us by faith in You alone - we cannot whip up, muster up, or fix up ourselves to have the kind of love that You have for others and for the world. Change me, change our leaders, change our churches. We fix our eyes on You Jesus - You are are only hope for transformation. Dave you know better than I how the gospel is expanding like never before in history. I pray that we as a Fellowship will be more than just nominal players. Christ has been, is and will be building His Church. I pray that we don't just stand on the sidelines or sit in the stands and criticize the coaches and players He has all over the world getting the job done. I pray we will be found faithful to the positions and opportunities that He has placed before us. What a privilege we have to join the triumphal procession of Christ in our world TODAY. The only age in which the church will be built is the church age and we be in it. I hope we haven't bought into the lie that says, "the harvest is over and the workers are to hang in there until the bus come comes to take them back to the farm. And that while we wait for the bus it is important that we examine each others crop for worms, that we clean up and rest up." I step off the soapbox now my brother. I pray you will continue to be refreshed and enriched in fellowship with our brothers and sisters gathered in Cape Town. I look forward to your posts and insights.